uuid : 0f2f1563-3cf0-4219-ba61-2b6ec35f06eb templates_id: 119518 templates_uuid: "b5f18028-fbe4-42a0-8f79-b51e14ceb615" title: "Letter of Intent (LOI) - Memorandum of Understanding" display_name: "Letter of intent (LOI)" meta_keywords: "Letter of Agreement, Memorandum of understanding (MOU) and LOI" description: "
Set out terms for a proposed agreement using this letter of intent (LOI) and give yourself more chance of succeeding and achieving your aims. Also called memorandum of understanding (MOU), this letter of intent includes details of the proposed agreement, pre-conditions, key obligations and has options to include legally binding obligations of confidentiality, exclusivity and non-solicitation. A letter of intent is an agreement between two businesses, which provides the basis for a future or proposed agreement. This can also be drafted as a contract between two businesses known as heads of terms, rather than a letter. However, the effect of these two documents is the same. Do I need a letter of intent? A letter of intent details the terms of a future agreement. You can use this letter of intent both during ongoing negotiations and once negotiations are complete. 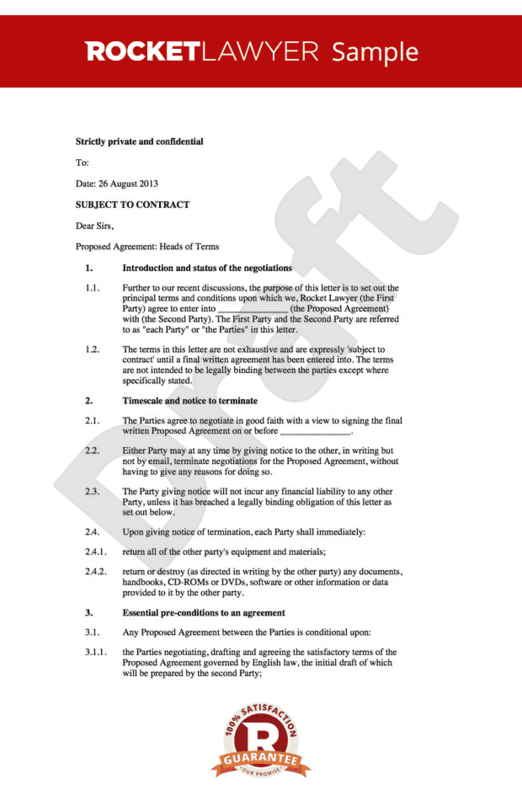 A letter of intent sets out both parties obligations to each other during this phase of negotiation (such as preconditions) and sets a basis for what the final agreement will look like when drawn up. A letter of intent can be used in lots of situations e.g. when looking to set up a joint venture, or negotiating a services agreement. What is due diligence and how does it apply to a letter of intent? Due diligence is the investigation of the other party, eg. potential clients or business partners, to find out any key risks to the proposed transaction. These can then be dealt with prior to the final agreement. It is common for businesses to impose due diligence as a precondition to the final agreement. In this document, either or both parties may require the other party to comply with preconditions. These are conditions that must be met by either party before the finalised agreement can take effect. For instance, you may want to require certain key documents to be submitted or approved by an external agency (eg. export control or safety certification), or check the articles of association to see if you need approval from shareholders. Confidentiality - this agreement will create legally enforceable obligations of confidentiality between the parties, unless the parties have signed a separate confidentiality agreement. Non-solicitation - this prevents either party\302\222s poaching the other\302\222s employees and customers. Exclusivity - this prevents the parties from negotiating with anyone else for some period of time. The period of time each clause is legally binding depends on the circumstances of each provision. However, the time and scope of the provisions (non-solicitation and confidentiality) must be reasonable. In this document you can choose the period of time for both exclusivity and non solicitation. It varies from 30 to 60 days for exclusivity and 1 to 12 months for non-solicitation. This agreement can be terminated at any time by giving notice to the other party. What remedies are available if one party breaches a legally binding part of this letter? The remedies available for non compliance will be adequate to the breach and apply only to breaches for legally binding terms eg. a non-solicitation or exclusivity provision. Adequate remedies as specified in this agreement may include an injunction (which may stop the person or a company from beginning or continuing an action invading the legal right of the other party), specific performance or other relief in addition to any other remedy such as damages. This letter of intent is governed by the law of England and Wales. \r\n" created_timestamp: "2018-10-08 04:36:36.0" modified_timestamp: "2018-10-08 04:36:36.0" active: true created_by: 102 modified_by: 102 dcm_id: 238 url_slug: "Letter-of-intent" meta_description: "Create a letter of intent (LOI) with step-by-step guidance from Rocket Lawyer. Also called memorandum of understanding (MOU), this letter sets out the terms for a proposed agreement. Try our letter of intent for free." time_to_complete: "20 minutes" role1: "Sender" role2: "Receiver"
Non-solicitation - this prevents either partys poaching the others employees and customers. More than just a Letter of intent (LOI) template, our step-by-step interview and guidance makes it easy to create your document. Easily create online, download, print and sign your free Letter of intent (LOI) in minutes. This document is also sometimes called: Letter of Agreement, Memorandum of understanding (MOU) and LOI.